Doing some reading beforehand, I stumbled upon this excellent little summary of the Nazgûl over on Screerant. It did seem a bit odd in my head to refer to them as “ghosts” (see fact 15), but I guess that’s in essence what they’ve become. I’ve reproduced their intro, but you can read the full list over on the Screenrant site. In the land of Middle-earth, few beings inspired as much fear and dread as the Nazgûl. 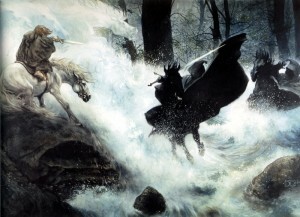 Ring-wraiths, Black Riders, the Nine; by any name, the Nazgûl were the most trusted and deadly servants of the Dark Lord Sauron, and they played a crucial role in his mission to retrieve the One Ring. Their backstory is an unforgettable cautionary tale; once Kings of Men, they were corrupted by the Rings of Power gifted to them by Sauron. Whatever goodness or nobility they once possessed was slowly drawn out of them as greed and lust for power consumed them, and their mortal bodies were warped and twisted into ghostly husks.